Posted on October 26, 2013 by J. There are four primary emotions: Anger, Fear, Joy, and Sadness. Ask a toddler how he feels, and you are apt to get “I’m mad”, “I’m scared”, “I’m happy”, or “I’m sad” as a response. As we get older, we start to delineate gradations of these main emotions, but every feeling still falls into one of these four major groups. Jealousy is a form of Anger. Worry is a form of Fear. Excitement is a form of Joy. Hurt is a form of Sadness. This is good. 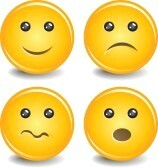 Whichever primary emotion you relate to, go with it initially. But don’t try to fine-tune it yet. If you think your character is driven by Jealousy, then get in touch with all the Anger you can muster about the scene. If you think your character is worried out of her mind, don’t go for Worry; go directly to Fear. Don’t be afraid of the Big Four. Don’t avoid them just because they are such huge emotions. Sometimes we get so fancy about how we define the emotional life of our characters that we shy away from the strength of these primary emotions. Don’t. Go with them. Indulge them. Find out what they have to tell you about the heart of the scene. Remember, you’re in rehearsals, and you’re in the early stage of rehearsals. You can afford to make mistakes now. You aren’t committing to anything. You’re simply exploring. You’re going to the edge of the boundaries, and perhaps even beyond them, so that you can be sure where the boundaries are. So when I read the confrontation between Willy Loman and Biff at the end of Death of a Salesman, I might respond primarily to Biff’s Anger. If that is what hits me first and I am playing Biff, it is likely that I will be inclined to focus on that aspect of the scene, to play up the Anger whenever possible. That’s not the only emotion going on in the scene, however. By the end of it, Biff is in tears, a big clue that Sadness is also a part of the scene. As Biff, I might start the scene with Anger, but ultimately I’ve got to make my way to Sadness by the end of it. Be careful, though, not to assume that it’s an either/or proposition. That when I’m feeling Anger, I can’t possibly feel Sadness as well. Or vice versa. Different, or even conflicting emotions, can co-exist. I’ll talk more about this in Part II. See Part II here. See Part III here.